According to my mother, I was born shy. As a baby, attention from well-meaning strangers made me cry instead of coo. Getting me to speak up in school required an act of legislation. I can blush so completely that even the part in my hair glows like a third-degree sunburn. By this point in my life, I’ve thankfully outgrown much of my shyness, but I still suffer at times from deeply ingrained social awkwardness. (My husband of twenty years has heard me put my foot in my mouth more often than he’ll admit.) So when I told a friend I’d be attending the 2010 Northern Colorado Writers conference and she claimed she’d never have the courage to do it, I wondered…how is it that I do? I decided that I’ve created a conference alter-ego. I named her Wendy, after Wendy Moira Angela Darling, who flew all the way to Neverland with just a little encouragement, some happy thoughts, and a bit of fairy dust. 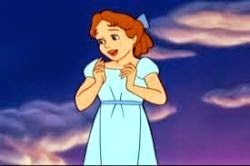 My Wendy doesn’t fly around in her nightgown, but she wears lipstick and nice shoes and shirts that button. She approaches other writers, even published ones, and chats with them. She doesn’t (as I would do) retreat to a corner chair, longing for sweatpants and 30 Rock. She is me, sprinkled with a pinch of whatever passes for fairy dust these days. Perhaps you are a reclusive writer who didn’t attend this year’s NCW Conference because the thought of mingling with a large group of strangers—even friendly ones who share your interests—makes your body respond in all kinds of anxious ways. Really, you might argue, why bother, when all the information presented at a conference is available elsewhere. Right? Well…not exactly. Reading the blogs of industry professionals is informative. Listening to them talk about the business at a panel or over dinner is an education. A good query letter is a necessary tool. Pitching a project in person is worth its weight in gold. Having fellow writers give you their opinions is helpful. Hearing agents and editors critique a slush pile can be a revelation. The bottom line is, if you’re serious about your writing career, you have everything to gain and nothing to lose by attending a conference. So, start now. Dream up your alter-ego. Give him or her a name. Batman, Oprah, Brad Pitt, Xena—anyone whose confidence you’d like to channel. Or create your own character. You are a writer, after all. Then, polish your work. Polish your pitch. Polish your nails, if you’re so inclined. And get out there. Wendy and I hope to see you at next year’s NCW conference. Maybe you’ll be the one in the (imaginary) superhero cape. Anyone else have a coping strategy for conferences? Love your description of the part in your hair glowing - that is so me! I love conferences. They fill me with energy and inspiration. Maybe my conference ego is as an Olympic diver, because I just plunge right in. I'm "Teresa" and don't even think of spelling it with an "h" as in "Theresa." Teresa gets up and gets going to places Linda Lou only thinks about.